I have had the pleasure of watching Patricia Fulton in court and in her office. 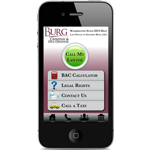 She is an outstanding attorney who obtains great results on cases that many attorneys shy away from. She has a reputation as a skilled trial attorney that also achieves fantastic results in negotiations. Having Patricia as counsel assures the best result possible for that client. I recently saw Patricia speak at a conference for other attorneys on the subject of DUIs. She was amazing.